Another disclaimer about tanning: I tan extremely fast & dark, and when I do, the texture and condition of my skin improve dramatically. I read a study suggesting that some people who tan easily may even benefit from the sun and may need a certain dosage of sun-acquired vitamin D. Don't know how true it is, but I'd love to hear your thoughts on this subject. Love this makeup, it's perfect for summer. Urban Decay eye shadow in Honey is sooo pretty! I love all your photos as always! your skin color is so pretty. i dont tan fast but when i do have a tan it's a really pretty golden olive color. I love that gold shadow on you with the winged liner! So pretty!!! I love theses colors!! And love that gloss!!! And super jealous of your gorgeous skin tone!!! You look beautiful! And I tan fast really quick too and I actually agree that my skin seems to thrive when I get daily sun exposure. I used to go running everyday and noticed how much clearer, softer, and smoother my skin got... but unfortunately, I HATE being tan. I don't feel it suits me at all, though it looks good on you and many others. 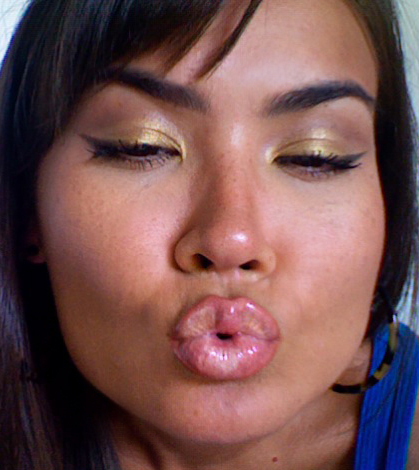 -love love gold eyeshadow on you! gorgeous as usual! You look so lovely!!! I am Mexican, but really light skinned. being mexican means that I am prone to the sunsrays, so I do not tan or get sunburned at all! So pretty! 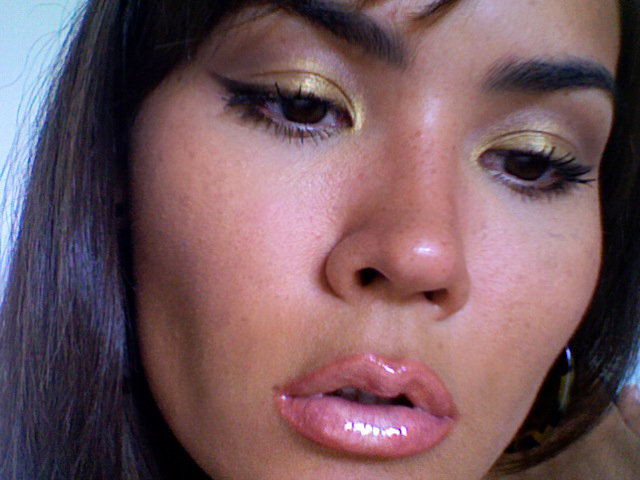 Urban Decay's honey is the perfect gold shadow. I think the look is great with your tanned skin. This is a STUNNING look. It works so beautifully with your toning! 10s across the board! Great look, love the gold e/s on the eyes, gorgeous! gorgeous look! the gold really looks beautiful on your skintone! 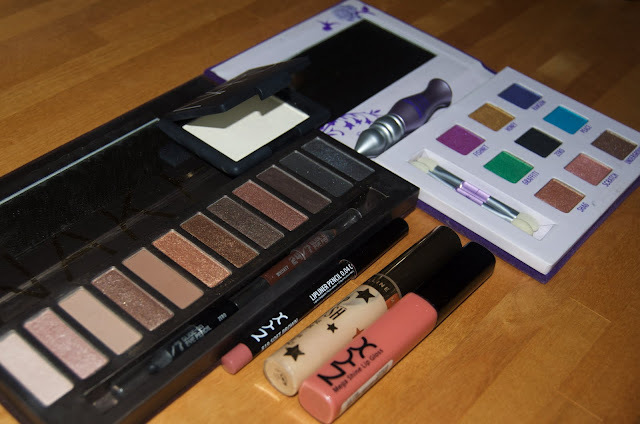 Gorgeous makeup, it looks perfect for the beach! u should definitely post the pic of u at the beach when u went to the black sea. 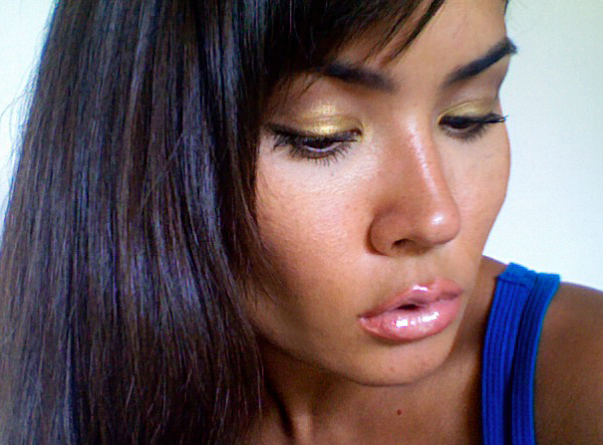 when u are like not even tanned...more like "blackened" but in a good way...btw love ur lipgloss!